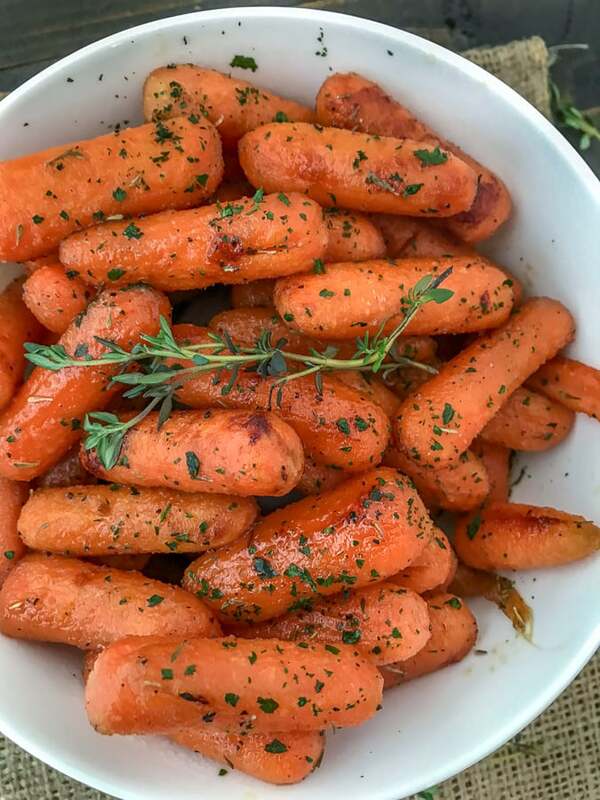 Maple Roasted Carrots – tender, sweet and simply the best roasted carrots. Made with maple syrup, olive oil, and herbs. Takes only 5 minutes to prep and 20 minutes in the oven! 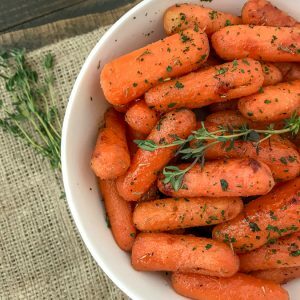 Perfect side dish for the holidays, for meal prep or any meal. This is such an easy side dish to make. It comes together in 5 minutes or less and only takes approximately 20 minutes to bake! Full of flavor and and undeniably delicious! 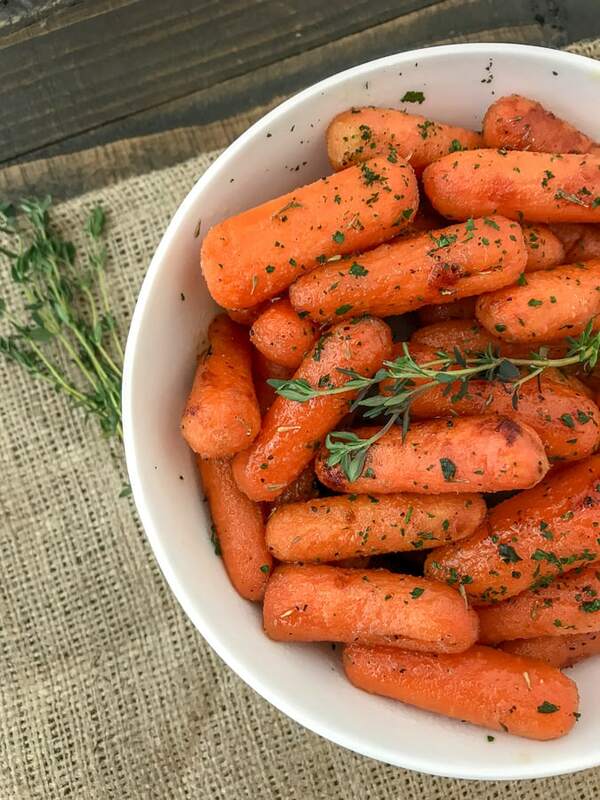 The best part of using baby carrots? You don’t have to peel or slice anything! Which makes life even simpler when you can cut a step in a cooking process. 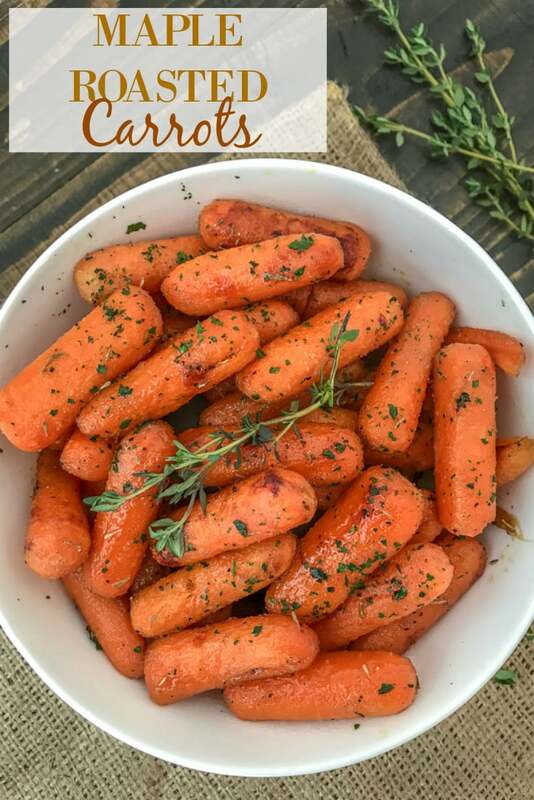 You can use regular carrots or baby carrots for this recipe. The baking time may vary depending on the thickness of regular carrots. I would recommend cutting them into chunks after peeling. All you need is maple syrup, garlic powder, onion powder, olive oil, thyme, salt, and pepper! Toss the carrots to thoroughly coat and bake until they are fork-tender. It’s as simple as that! Creamy Mashed Sweet Potatoes – Creamy, fluffy mashed sweet potato perfection! Takes 20 minutes or less to make, full of brown sugar, cinnamon flavors, and the perfect lightened-up side dish for the upcoming holiday season! Cheesy Hasselback Potatoes – Hasselback style potatoes with an au gratin potato twist! Baked until crispy on the top and fluffy, creamy and cheesy on the inside. A flavorful side dish for any occassion. Garlic Parmesan Mashed Cauliflower – A healthier spin on the traditional mashed potatoes dish – but with cauliflower! Very easy to make and so creamy and fluffy that you won’t be able to tell that it’s not potatoes! Cheesy Broccoli Ham Casserole – Have any leftover ham or turkey from the holidays? Add it to this recipe to enjoy as a side dish or main meal option! Comes together quickly, with a homemade creamy cheddar cheese sauce and a crispy, butter parmesan cracker topping! Sure to be a hit at your dinner table. Super Crispy Garlic Parmesan Potato Bites – A blog subscriber favorite! If you’re the kind of person who picks the extra crispy fries out of a box, then this is the recipe for you! 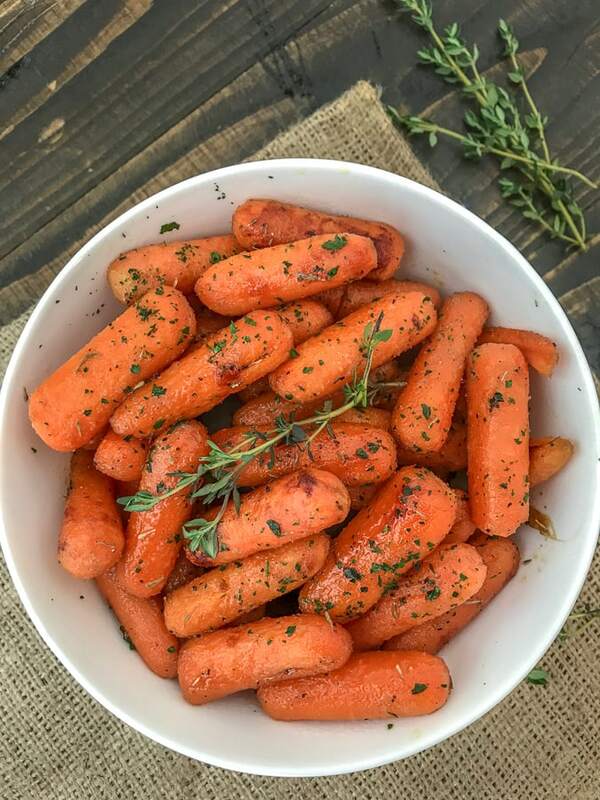 Maple roasted carrots that are tender, sweet and roasted to perfection! Comes together quickly and easily, making for the perfect side dish for any occasion! Preheat oven to 450 degrees F. Spray a baking sheet with nonstick cooking spray. To a small bowl, combine the maple syrup, onion and garlic powder, thyme, olive oil, salt and pepper (season to taste). Mix well. Add in the carrots and toss to thoroughly coat them. 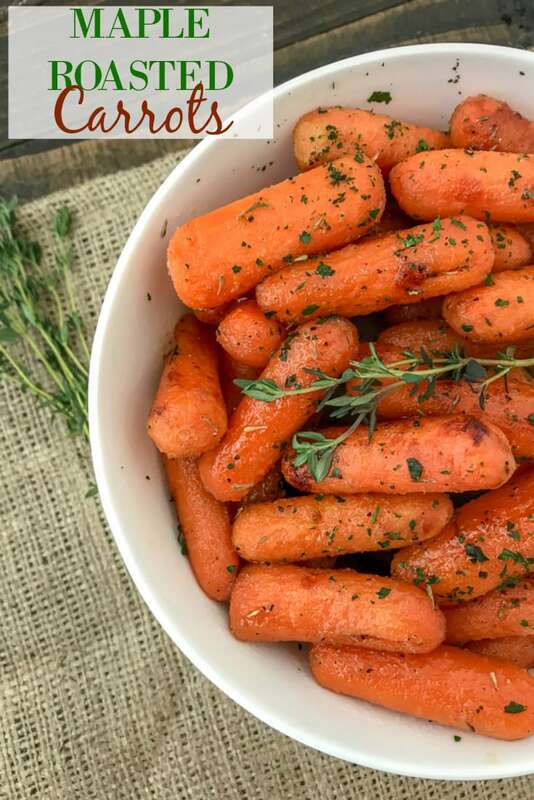 Place the carrots onto the prepared baking sheet. Pour any remaining maple syrup mixture over the top. Bake for 20-25 minutes, or until fork tender, stirring at 10 minutes. Serve warm. Garnish with freshly chopped thyme and parsley. CALORIES BASED ON 1 SERVING OF 6.